Make sure that you’re taking full advantage of any employer matching contribution for which you may be eligible with your company’s retirement plan. Contribute the maximum amount that the employer will match. 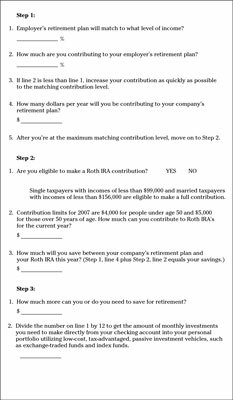 If eligible, make the maximum contributions to your and your spouse’s (if applicable) Roth IRA accounts each year; take your contributions automatically out of your checking account each month. A Roth IRA is the best retirement funding vehicle — from a tax standpoint — ever! Although you don’t get a deduction when you contribute to a Roth IRA, all the earnings and withdrawals on the account are tax-free forever. You can establish a Roth IRA account at most banks, through investment advisors, or directly with a low-cost, no-load mutual fund company like Vanguard or a deep discount broker like Scottrade or ShareBuilder. Making monthly contributions is much easier than coming up with the whole year’s contribution at once. You can set up direct automatic investments from your checking account into your Roth IRA account. Build your personal portfolio with low-cost, tax-advantaged-passive investment vehicles, such as exchange-traded funds (ETFs) and index funds. You need to have investments that you can tap into if needed prior to retirement. Also, when you retire and pull money out of your retirement account, 100 percent of that withdrawal is taxable to you as ordinary income. Capital gains tax rates are much lower. You may be much better off from a tax standpoint to pay minimal capital gains now rather than the tax for ordinary income in the future. Index funds are a way individual investors can own the stock market that you hear about on the news, such as the Standard and Poor 500 Composite Index (S&P 500, for short). Index funds have been available through no-load mutual fund powerhouses like Vanguard for decades. However, the range of options now available has exploded in the last few years. You can now buy an exchange-traded fund (ETF) that invests exclusively in United States Treasury Inflation Protection Securities. Rather than buying one bond for $10,000, you can literally buy one share of an ETF, which trades like stocks, incurring a transaction fee to buy or sell shares. And with the advent of deep-discount online brokerage firms, you now can afford to make monthly purchases of exchange-traded funds. Which automatic savings programs are available to you, and how much can you direct to each of these automatic plans? Use the Making Your Investments Automatic Worksheet to put these steps in action. Click here to download and print the Making Your Investments Automatic worksheet.